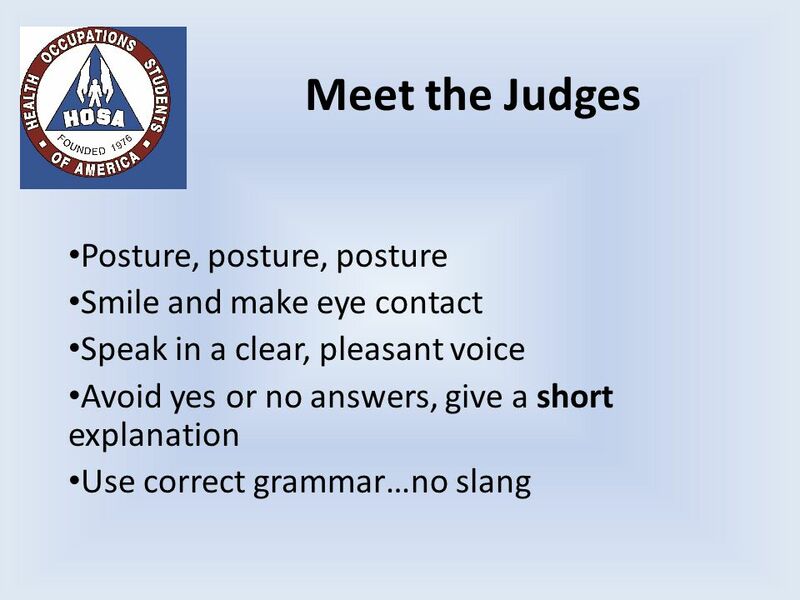 Keys to Success for HOSA Competitors. Follow the directions. Be prepared The directions are detailed in the HOSA event guidelines. The most current version. 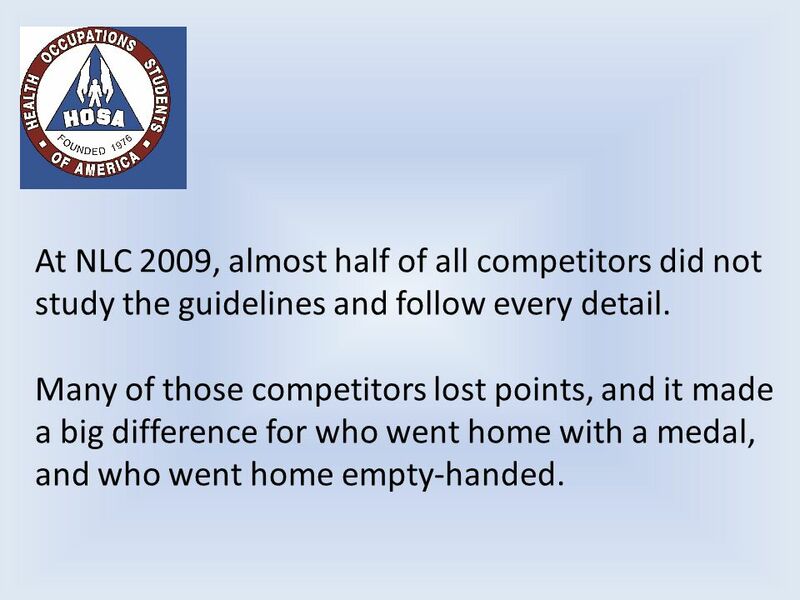 3 At NLC 2009, almost half of all competitors did not study the guidelines and follow every detail. Many of those competitors lost points, and it made a big difference for who went home with a medal, and who went home empty-handed. 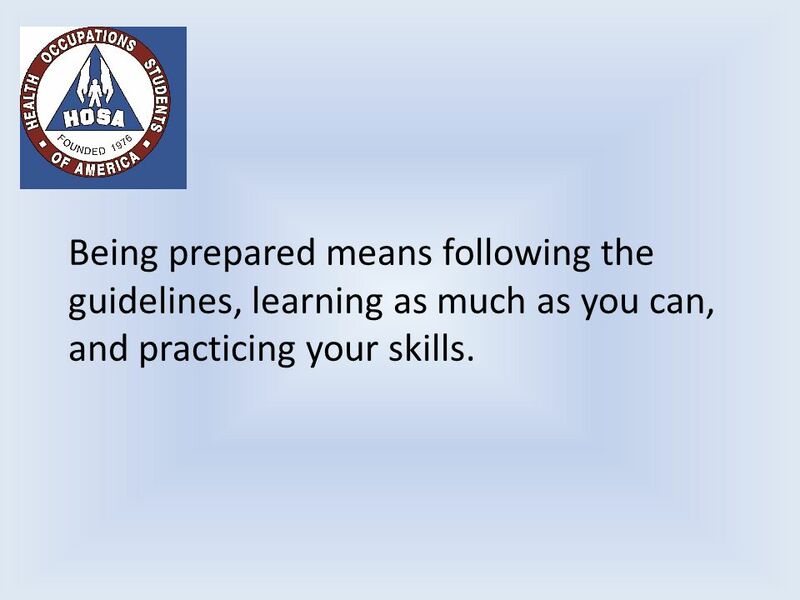 4 Being prepared means following the guidelines, learning as much as you can, and practicing your skills. 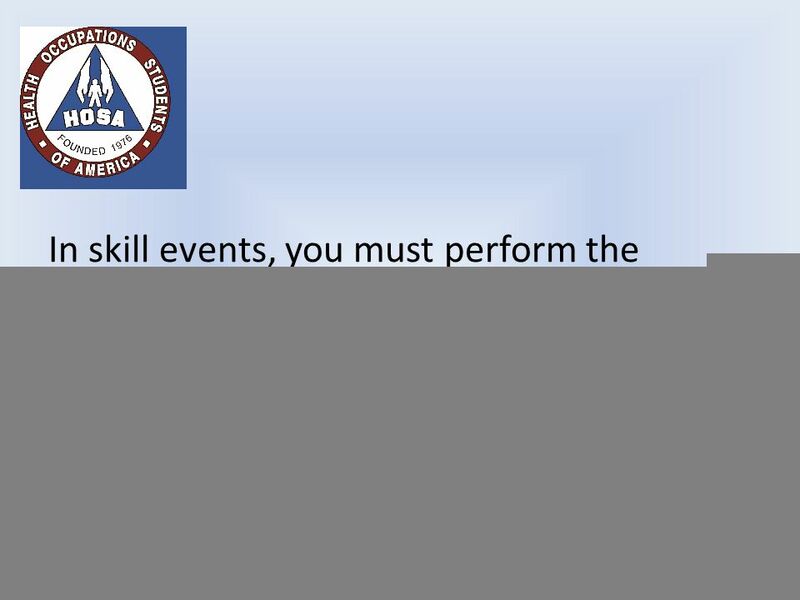 5 In skill events, you must perform the procedures at 70% accuracy or higher in order to be recognized. That takes practice!! 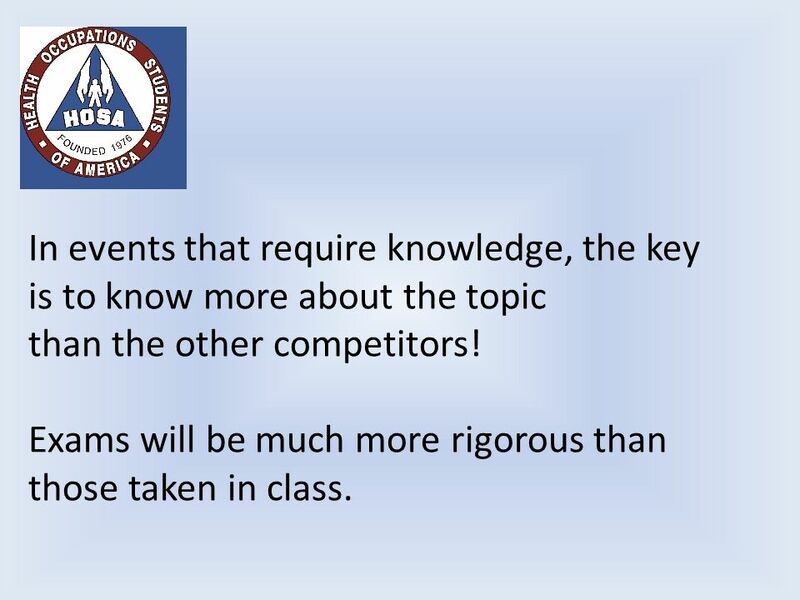 6 In events that require knowledge, the key is to know more about the topic than the other competitors! Exams will be much more rigorous than those taken in class. 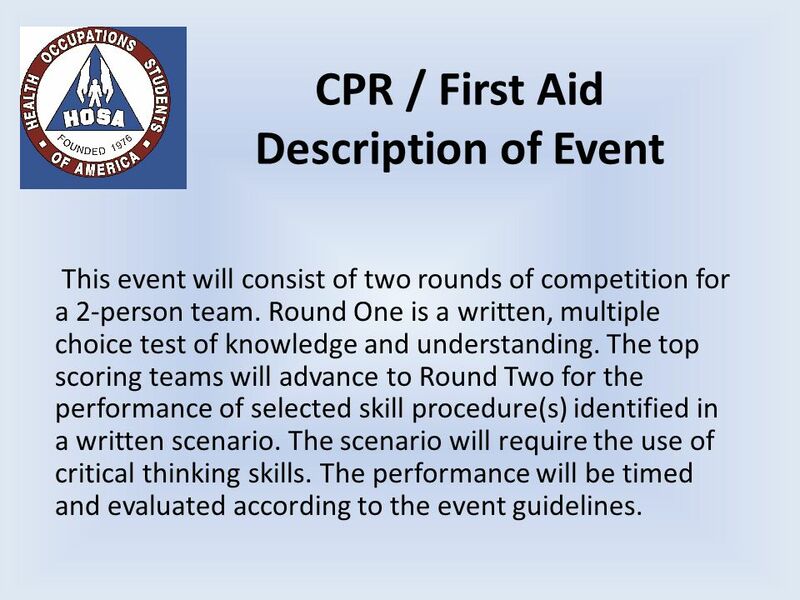 7 CPR / First Aid Description of Event This event will consist of two rounds of competition for a 2-person team. Round One is a written, multiple choice test of knowledge and understanding. The top scoring teams will advance to Round Two for the performance of selected skill procedure(s) identified in a written scenario. The scenario will require the use of critical thinking skills. The performance will be timed and evaluated according to the event guidelines. 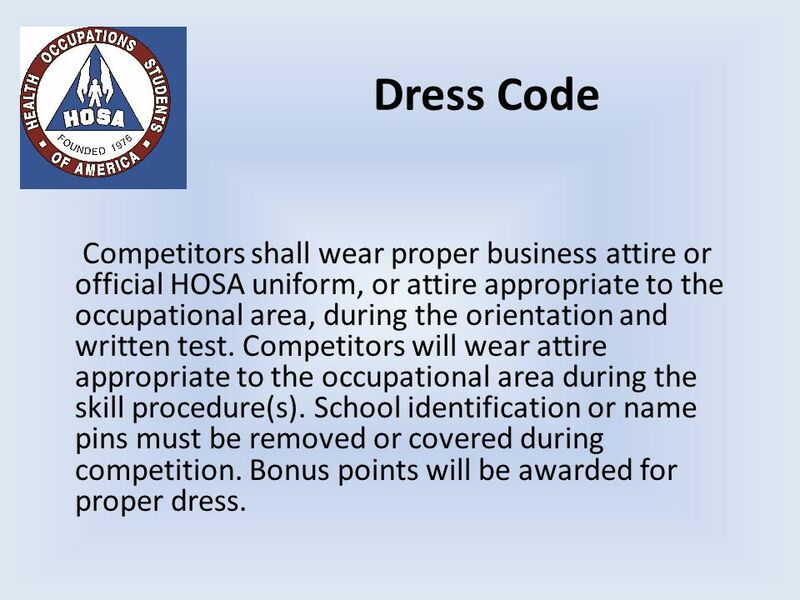 8 Dress Code Competitors shall wear proper business attire or official HOSA uniform, or attire appropriate to the occupational area, during the orientation and written test. 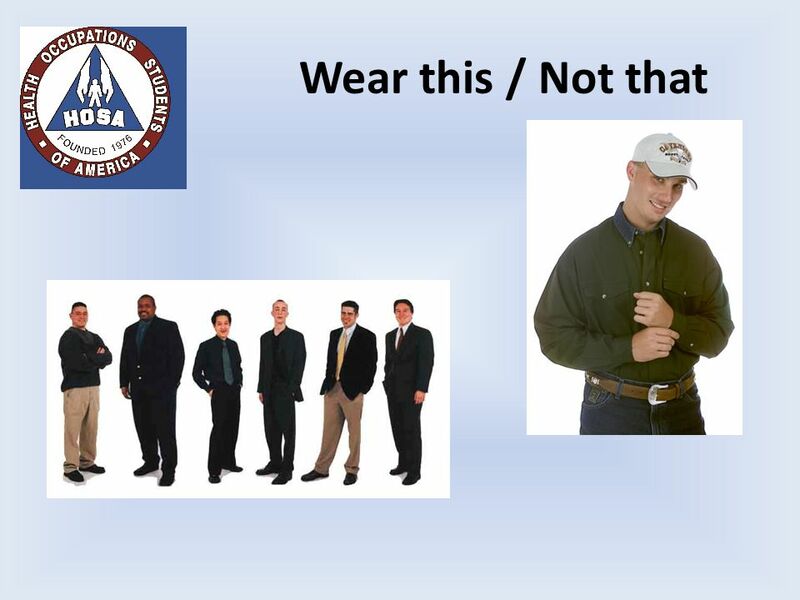 Competitors will wear attire appropriate to the occupational area during the skill procedure(s). School identification or name pins must be removed or covered during competition. Bonus points will be awarded for proper dress. 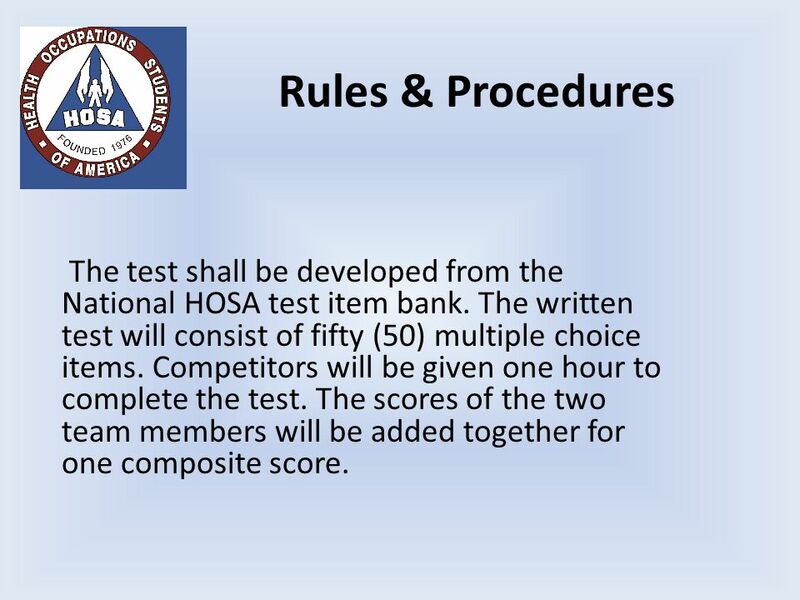 9 Rules & Procedures The test shall be developed from the National HOSA test item bank. The written test will consist of fifty (50) multiple choice items. Competitors will be given one hour to complete the test. The scores of the two team members will be added together for one composite score. 11 All competitors shall report to the site of the event orientation at the time designated. The Round One test will immediately follow the orientation. No proxies will be allowed for the orientation. No study materials are allowed in the room. 12 Resources All official references are used in the development of the written test. The specific reference selected for each procedure is listed in the Facilities, Equipment and Materials section of these guidelines. American Heart Association, Basic Life Support for Healthcare Providers, Latest edition. Distributed by Channing L. Bete Co., Inc. Simmers, Louise, Diversified Health Occupations (OR Introduction to Health Science Technology) Delmar, Latest edition. 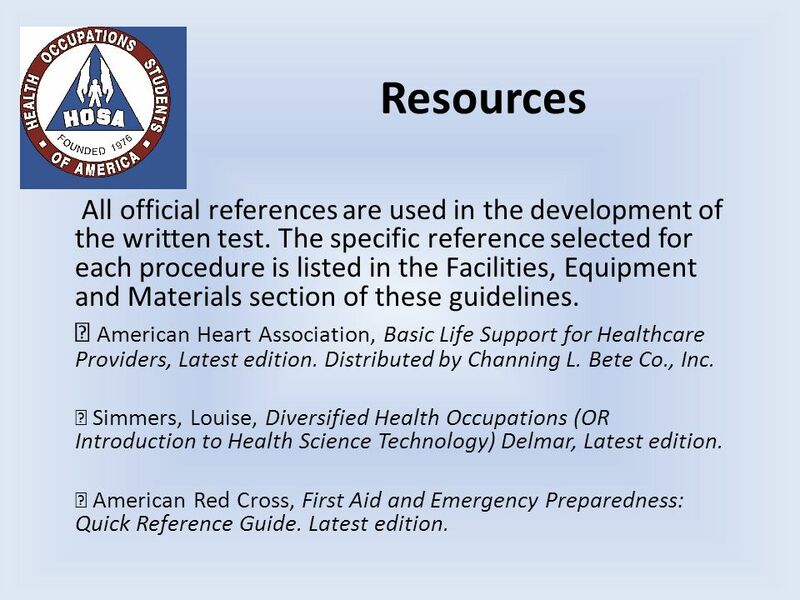 American Red Cross, First Aid and Emergency Preparedness: Quick Reference Guide. Latest edition. 14 Dress for Success You only have one chance to make a great first impression. Professional dress means: No tennis shoes, jeans, or t-shirts. Clothes should be well pressed and neat. 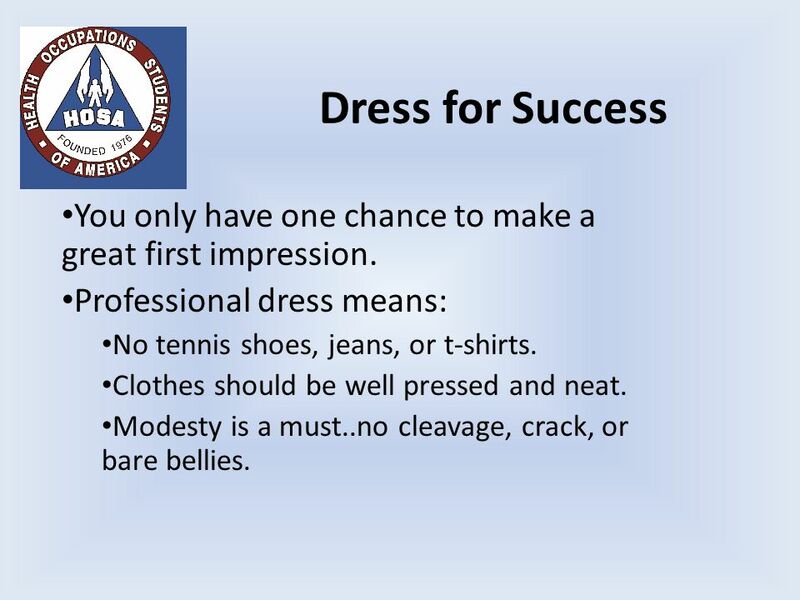 Modesty is a must..no cleavage, crack, or bare bellies. 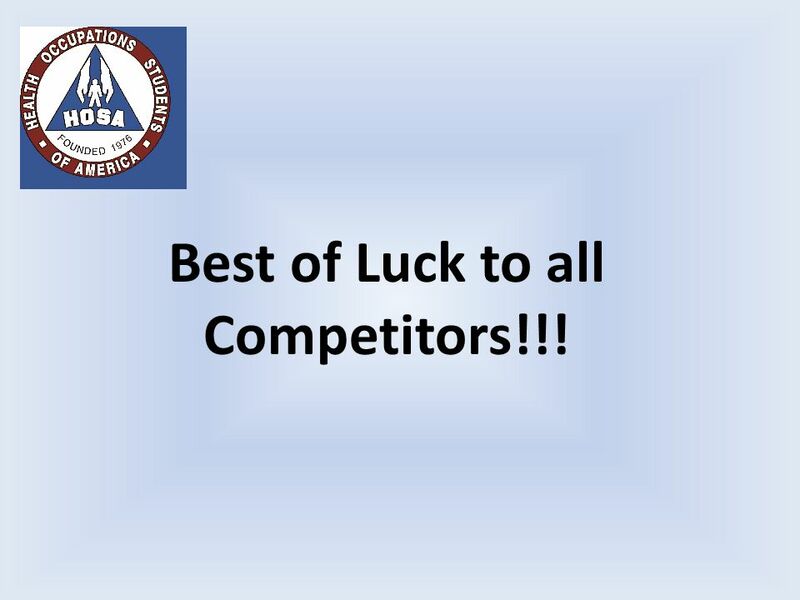 18 Best of Luck to all Competitors!!! 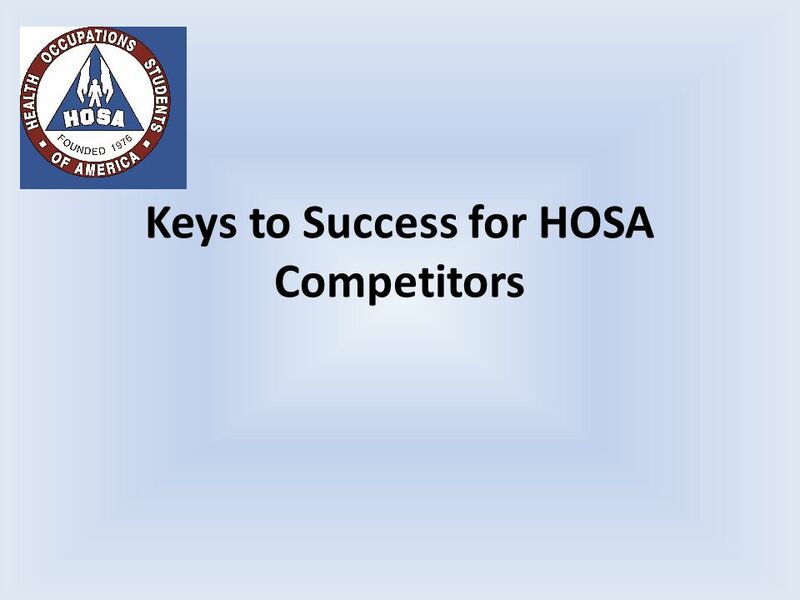 Download ppt "Keys to Success for HOSA Competitors. Follow the directions. 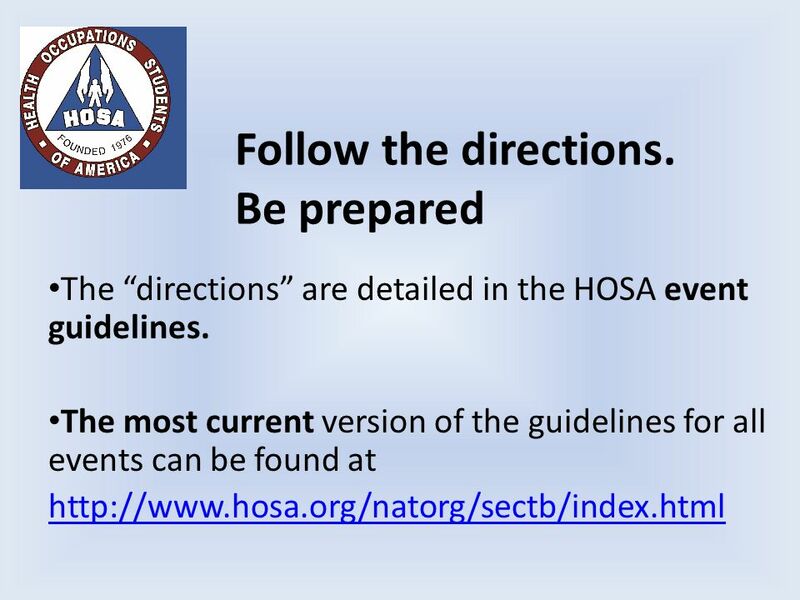 Be prepared The directions are detailed in the HOSA event guidelines. The most current version." 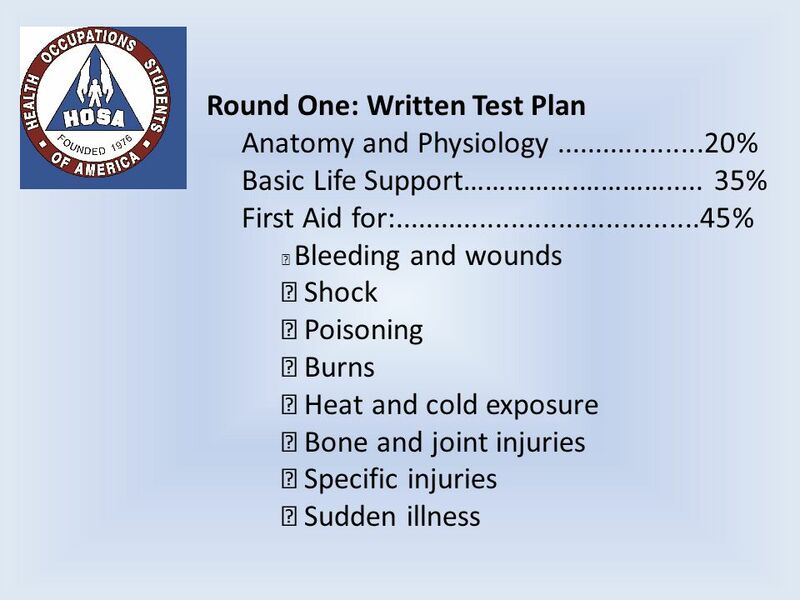 What first aid steps would you administer? Basic First Aid. 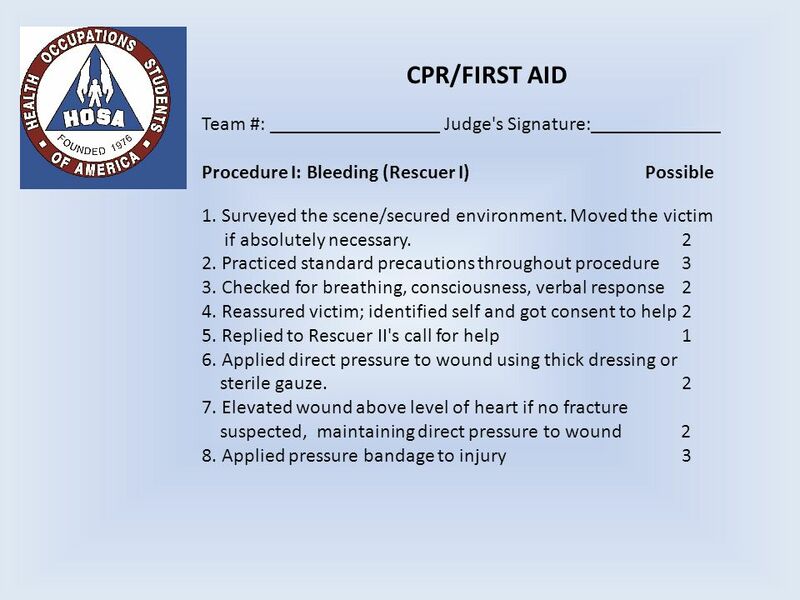 © Business & Legal Reports, Inc Session Objectives Recognize the benefits of obtaining first-aid and CPR certification Identify. Division of Youth Corrections Emergency First Aid and CPR. SGTM 16 C: Basic Life Support Slide 1 SGTM 16 C: Basic Life Support. A First Aid Guide for the Youth Coach Prevention and Care of Injuries. First Aid and Preparedness © Copyright 2003 The American National Red Cross. All rights reserved in all countries. PCH First Aid 8th Grade. Objective- To learn how to handle emergency situations with children with confidence.  Test  Must make at least an 80% to pass.. PCH First Aid. 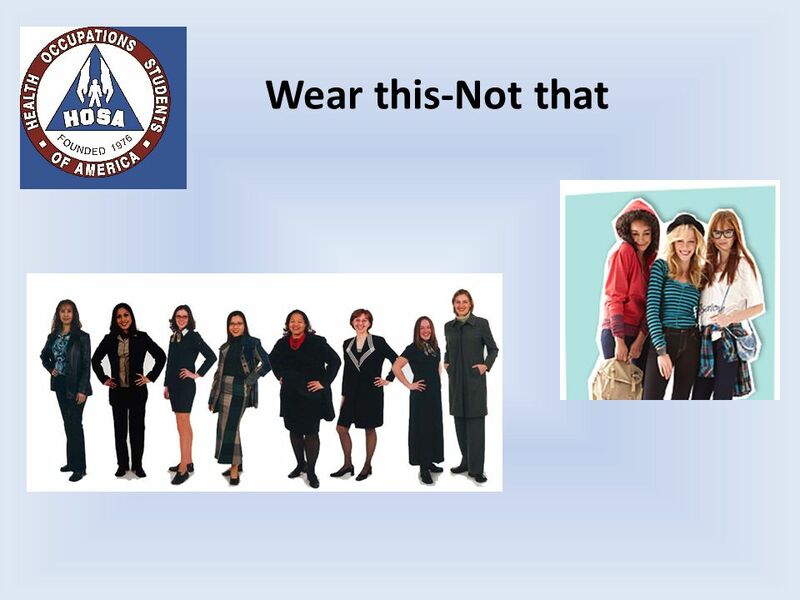 This presentation is available for use by school nurses only when the content is approved by the nurse or school district that wishes to use it. It is. NATIONAL PRODUCTIVITY COUNCIL,GUWAHATI1 BRPL TRAINING PROGRAM Emergency First Aid NPC, GUWAHATI. Division of Risk Management State of Florida Loss Prevention Program.